LA Cops is reminiscent of those 1970 retro cop TV shows in many ways. You have the stereotypical cops eating donuts, that one police chief who always seems to find something to yell at his subordinates about and of course some cheesy one-liners. It tries very hard to be a compelling game with some of its gameplay mechanics, teamwork, and cartoonish visuals but unfortunately it falls flat on its face. After a tutorial that familiarizes you with the game you have to choose two characters to play with out of the six available. 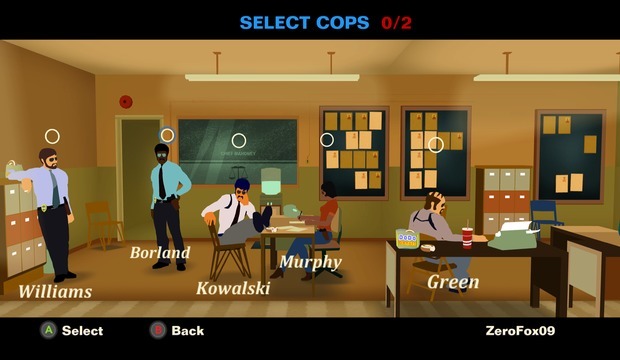 With these two cops you are thrown into a stage that is filled with a dozens of criminals. LA Cops tries to force you to think strategically by utilizing both characters. You can only control one character at a time but you can position your partner wherever you choose for backup. Each stage has a similar objective. Basically you must clear out the area and reach the end goal which could be rescuing a hostage, securing drugs, or anything along those lines. The stages usually consist of several floors. Trial and error plays a major role in order to clear the levels. I had to learn each stage and memorize where enemies where most of the time. LA Cops punishes players that try to speed run the levels Rambo style. This isn't an easy game. Going in gun blazing is the quickest way to get riddled with bullets. In some ways the game is unfairly difficult. Camera angles makes it sometimes impossible to see an enemy before or at the same time they see you. Enemy AI also has god-like reflexes and are incredibly smart. I would normally see this as a good thing but since the game relies heavily on using your partner to succeed it doesn't seem right that your partner AI isn't nearly as smart as the enemies. For example, sometimes I would stage my partner behind a door so he could kill anyone who walks in. Well that didn't happen, instead he would watch as enemies strolled past him until they turned around and just shot him. In opposite scenarios an enemy would blast us away in a matter of seconds. Since the partner AI was so terrible, I ended up using him as a second life instead of depending on him for backup. At the end of each level you are scored based on how well you did. Instead of killing enemies you can arrest them which will lead to a better score. There is a major issue however in this scoring system. LA Cops encourages you to use teamwork and this mechanic is what the game is supposed to be built around but there is no way to tell your partner to arrest someone instead of killing them. This leads to your partner killing enemies you are trying to arrest which in turn gives you a lower score. If you want to attempt to arrest every criminal on a stage, you will have to abandon your partner and go solo. For every enemy you kill you are awarded experience that allows you to level up certain stats. You can purchase new weapons, increase health, magazine size, bullet damage and a few other upgrades that makes life a tad bit easier. Cut-scenes are played out between levels to try to give you a grasp on the plot but the horrible voice acting made me want to mute my television all together. I actually enjoyed the soundtrack however. The guitar-rock songs worked really well with the setting of the game. On the surface LA Cops appears to be a solid top-down shooter. Unfortunately, it relies too heavily on a broken teamwork system. The shoddy AI works against the game and results in the game being more of a frustrating title than an fun one. Killing hasn't been this fun since Blood Money. Despite the technical issues, Hitman is off to a promising start to the "season". The smooth controls, beautiful visuals, and incredibly detailed level design does a solid job in bringing the world's deadliest assassin to current generation consoles.